The new game will launch in Japan on July 25th, fingers crossed we get an English release! When we last left Phoenix Wright, the hero of the Ace Attorney courtroom simulators, he was in a bit of a sorry state. Delegated to being a back-seat minor character after handing the reins over to young up-and-comer Apollo Justice, Wright had really let himself go, looking more like a street tramp than a courtroom shark. The latest issue of Famitsu magazine has shown us an image of everyone's favorite defense attorney in a new take on his traditional blue suit, and has revealed the game's release date and pre-order bonuses. 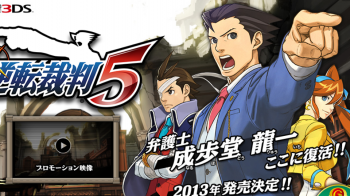 The game will launch in Japan on July 25th, where it is known as Gyakuten Saiban 5. Purchase Gyakuten 5 before August 15, and you'll be given some free alternate-outfit DLC. It includes Phoenix's original suit from the first three Ace Attorneys, and one new outfit each for Apollo Justice and Kokone Kizuki, the as-yet-unnamed-in-English woman who helps Phoenix out in this installment. While the latest Ace Attorney game, Ace Attorney Investigations 2, was not given an English port due to poor sales of Investigations 1, here's hoping that the latest installment of the main series will see a translation, as the original four Ace Attorney games proved to be smash hits when they were first released. The Famitsu preview revealed that Apollo Justice, the main character of Ace Attorney 4, will be a playable character in the game's courtroom scenes. In addition, it offered us a glimpse of one of the game's bad guys, a prosecutor named Jin Yugami. Jin is currently serving time for murder, but has been allowed to temporarily return as a prosecutor for some reason. I would assuming killing someone would get you disbarred from practicing law, but apparently not so in the wacky future world of the Ace Attorney games.